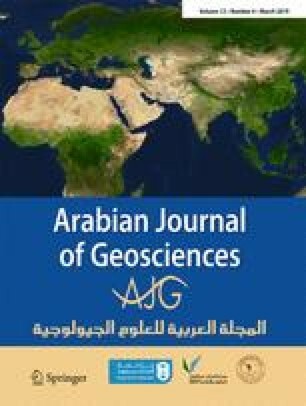 The objective of this paper is to develop a forecasting model for the annual rainfall depth in Saudi Arabia (SA). The annual rainfall data of four stations are used as a pilot study. The coefficient of variation (CV) of the rainfall is relatively moderate (CV < 0.8). The annual rainfall records have been modeled by applying the first-order autoregressive AR(1) model with and without skewness. Normality has been tested (skewness coefficient, γ < 0.7 and kurtosis coefficient with respect to normal < 0.64 except one station). Most of the data has proven to normality. Autocorrelation analysis has shown that the lag one autocorrelation is relatively low (ϕ1 < 0.3). This reflects poor autocorrelation which is typical in arid and semi-arid regions due to scarcity and intermittency of the rainfall. Monte Carlo approach has been applied to estimate the confidence interval of the forecasted series. Although the first lag autocorrelation was weak (the correlation time scale is in order of 1 year), the modeled annual rainfall by AR(1) is fairly good. The results also showed that there is no significant skewness in the data, and therefore, the use of AR(1) without including skewness is best to represent the data. The developed procedure can be further applied to other stations in SA. The authors are thankful to the Department of Hydrology and Water Resources Management, Faculty of Meteorology, Environment and Arid Agriculture, King Abdulaziz University, for providing a platform to conduct this research study. The authors would like to thank Abdelaziz Albishri and Anis Chaabani for the GIS map. The authors would like to thank the anonymous reviewers for their valuable comments.